Splash pages, you gotta love 'em. A blank canvas where the artist can hit you with a large dose of illustrated 'wow'. 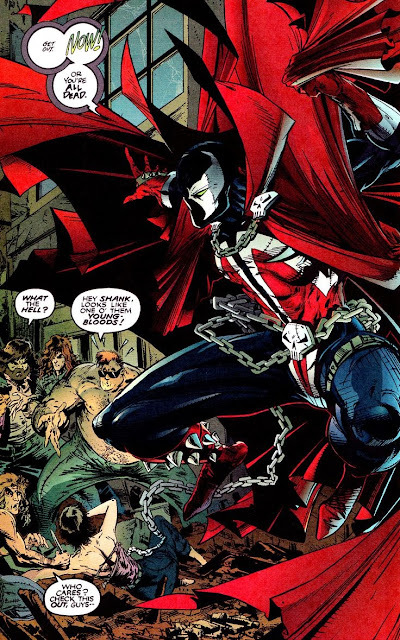 This week, I wanted to trip back to the earliest days of Spawn and capture Todd McFarlane's creation in all his massive cape swirling, chain-wielding best. And I have. Some fault the early Image days for being splash-page centric, but when they are as massive and detailed as this, even decades on, I think they can be excused. If this was preview art for tomorrow's issue, it would still have people lining up in droves! With Todd leaving Spider-Man's crazy webs to join Image, you knew something windblown was going to mark his creation, but I'd never have guessed a cape - or at least one as wild as Spawn's. Having a life of it's own, it became a character unto itself and even more so when Spawn finally got animated and hit Hollywood. While others started drawing capes with equal overkill, without the supernatural to base them from, they just added to another 90's fad, while Spawn's continued to rise above. What do you think? For more great splash pages, click here. Hey King! Yeah Angela at Marvel sure was a turn for the books. The Spawn animated series seemed to make the whole thing make more sense than I got reading the episodes of the comics, but yeah that movie didn't have the same appeal. McFarlane though as an artist, I'd kill to see handle Dr Fate again. That was the first character I brought of his art, and seeing how he treated him now (with or without Spawn) would be awesome. I never could get into the Spawn cartoon... I dug The Maxx one, though. The Savage Dragon cartoon was cheesy, but fun. I did not even know he penciled on Dr. Fate. -Have to keep an eye out for that. Do King! It's an issue of All Star Quadron. A bit dated now, but as one of his earliest gigs it sure breaks alot of ground for what is to come.